Zeolite powder mainly works in the intestines by filtering your blood down there. Our Liquid Zeolite enhanced with DHQ is the next generation in toxin & heavy metal detoxing! Liquid Zeolite is more advanced, highly refined, and engineered to get into the blood stream and travel the 60,000 miles (96,560 kilometers) of blood vessels getting into all of your cells and then it safely binds and removes toxic heavy metals (including mercury, arsenic, lead, pesticides, herbicides, volatile organic compounds, radioactive elements and others) without removing beneficial minerals such as calcium or magnesium. Zeolite powder contains ONLY zeolite! But, thanks to the other amazing ingredients in Liquid Zeolite you will experience many additional benefits as well. Our LIQUID ZEOLITE™... contains: humic acid/fulvic acid complex, ultra-cleansed volcanic zeolite (clinoptilolite) and a blend of angstrom-sized trace minerals, phyto-nutrients, macro-nutrients & micro-nutrients, DHQ (Dihydroquercetin), "M-Water", citric acid, natural potassium sorbate (for freshness). Liquid Zeolite does EVERYTHING zeolite powder does PLUS a whole lot more! Liquid Zeolite has many more testimonials than zeolite powder. Liquid Zeolite is recommended by more physicians & healthcare practitioners. Liquid Zeolite is very efficient, very convenient, and very affordable. Liquid Zeolite has maximum bioavailability, because the humic acid in Ultra Liquid Zeolite™ Enhanced with DHQ is organic. And, because the zeolite is actually suspended in the humic molecules, 100% of Ultra Liquid Zeolite™ Enhanced with DHQ is carried into the cells.There is no substitute for organic humic acid to revitalize cells and reverse cellular degeneration. Ultra Liquid Zeolite™ also contains Dihydroquercetin (DHQ), also known as taxifolin, is a bioflavonoid similar in structure to that of quercetin. Almost 600 studies conducted over the last 50 years have investigated its effectiveness and safety. Flavonoids perform two important functions... they strengthen your body’s immune response and they act as powerful super-antioxidants. Flavonoids are polyphenolic compounds that are ubiquitous in nature and are categorized, according to chemical structure, into flavonols, flavones, flavanones, isoflavones, catechins, anthocyanidins and chalcones. Over 4,000 flavonoids have been identified, many of which occur in fruits, vegetables and beverages (tea, coffee, beer, wine and fruit drinks). The flavonoids have aroused considerable interest recently because of their potential beneficial effects on human health-they have been reported to have antiviral, anti-allergic, antiplatelet, anti-inflammatory, anti-tumor and antioxidant activities. Flavonoids may help provide protection against these diseases by contributing, along with antioxidant vitamins and enzymes, to the total antioxidant defense system of the human body. Epidemiological studies have shown that flavonoidintake is inversely related to mortality from coronary heart disease and to the incidence of heart attacks. Antioxidants are compounds that protect cells against the damaging effects of reactive oxygen species, such as singlet oxygen, superoxide, peroxyl radicals, hydroxyl radicals and peroxynitrite. An imbalance between antioxidants and reactive oxygen species results in oxidative stress, leading to cellular damage. Oxidative stress has been linked to cancer, aging, atherosclerosis, ischemic injury, inflammation and neurodegenerative diseases (Parkinson's and Alzheimer's). The Physician's Desk Reference states that 85-90% of nutrients in liquid supplements are absorbed in 22 to 30 seconds.1 Compare this to hours it takes for the nutrients in pills to be absorbed by the body. 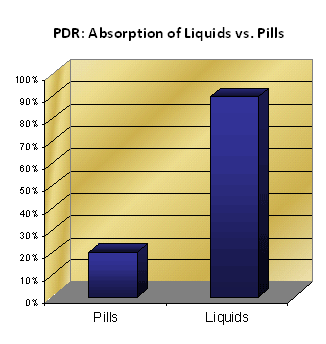 Moreover, it has been demonstrated that only 10%-20% of the nutrients in pills actually are absorbed.